FutureCare Homewood, located near Johns Hopkins University, is a for-profit corporation operating 141 certified beds for both short-term and long-term residents. This FutureCare facility's services include on-site dialysis, cardiac rehabilitation, pain and wound management, and specialized IV therapies. It has been managed and operated by FutureCare since 2007, a Pasadena, Maryland-based company that has 14 nursing homes in our state. 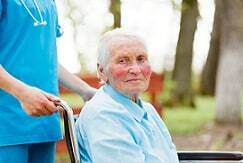 Our nursing home lawyers have successfully battled this nursing home chain. We think the nursing home care in this state is awful and that a contributing cause is nursing home chains that put profits over people. But FutureCare is a local Maryland company that seems to do a slightly better job than the other big nursing home chains. We may be extra hard on FutureCare because they seem to be involved in so many lawsuits. But, in their defense, they do have 14 nursing homes in the state. The last Medicare health inspection at FutureCare Homewood found only three deficiencies in total: less than half the U.S. average (7.1) and less than a third of the Maryland average (11.4). This facility got a 4-star rating (above average) for that inspection, as well as a 4-star Medicare rating overall. On fire safety, this Baltimore facility was perfect, with zero deficiencies (versus the Maryland average of 4 deficiencies, and the U.S. average of 3.4 deficiencies). FutureCare Homewood did have a complaint inspection concurrently with the last standard Medicare inspection, in April 2016. But this is not the type of thing that attracts lawsuits or even has a meaningful long-term impact on many patients. Medicare inspectors investigated some damaged window molding. They said that a resident wasn't drinking from the right kind of specialized cup. The facility had failed to implement a dental care plan for a resident, and it was tardy in starting restorative services for a resident who was having difficulty walking. Each of these complaints was found to pose minimal harm or potential for actual harm. With a 4-star rating for staffing overall, this facility exceeded the Maryland and U.S. averages for total nursing time per resident per day (beating Maryland by 15 minutes, the U.S. average by 24 minutes). It was very quite generous with RN time per resident: 1 hour, 24 minutes per resident per day, versus 59 minutes for Maryland on average, 50 minutes nationally on average. Its RN staffing score was tops with five stars. This registered nurse commitment is particularly impressive because those are the most expensive nurses. FutureCare Homewood gave residents less than the average amount of time with LPNs and LVNs (licensed practical nurses, licensed vocational nurses) and physical therapists, but made up for it in part by providing more than the average amount of time with certified nursing assistants. You cannot help but wonder if they are sometimes skipping over quality with at least a portion of their hires - you would expect better quality scores, right? But that is mere speculation. All that nursing care translated into mixed results regarding outcomes, as gauged by Medicare's quality measures. For this overall metric FutureCare, Homewood got three stars, reflecting some very good scores and some that were less so. For short-term residents at nursing facilities, it would stand to reason that two of their most important concerns are minimizing their pain (while they're in the facility) and improving their functionality (so they can go home). On these two metrics, FutureCare Homewood did exceptionally well. Only 7.9 percent of its short-stay residents reported having moderate to severe pain, versus 13.8 percent on average for Maryland, and 16.4 percent on average (twice as high) nationally. Three-quarters of this facility's short-stay residents experienced improvement in function, versus less than two-thirds of residents, on average, in Maryland and across the U.S.
On the downside, this facility's short-stay residents had moderately higher-than-average usage of antipsychotic meds - a classic large nursing home problem -- and incidences of pressure ulcers (bed sores). And for some reason, this facility little availed itself of the obvious preventive measures of flu and pneumonia vaccinations - giving shots to only about half of its short-stay residents (versus the state and U.S. averages of about four-fifths). For long-stay residents, FutureCare Homewood had more positive marks than negative ones. As with its short-stay residents, its long-stayers were far less likely to report having serious pain (2.5 percent, less than half the Maryland and U.S. averages of 6.0 and 7.8 percent, respectively). Statewide and nationally, about three in 100 residents (on average) will suffer a fall with injury; at this facility, it hardly happened at all (only 0.2 percent of residents so affected). FutureCare Homewood was perfect on using physical restraints: it used none which is impressive and not uncommon at FutureCare facilities. Long-stay residents here also were less likely than the state and U.S. averages to lose too much weight or require ongoing catheterization. The rate of depressive symptoms among this facility's long-term residents was a bit higher than the Maryland and U.S. averages, but this facility was significantly less apt to dole out antianxiety or antipsychotic meds (which is considered a positive). On flu and pneumonia vaccinations, this facility still fell short of the Maryland and U.S. averages, but only moderately so (reaching eight out of ten residents, versus nine out of ten on average, statewide and nationally). A notably negative metric at this facility was the incidence of pressure ulcers among long-stay residents here: 10.4 percent, versus 6.9 percent for Maryland, 5.7 percent for the U.S. The incidence of pressure ulcers, or bed sores, is one important indicator of the amount of care that residents receive. FutureCare Homewood also scored a little less well than the Maryland and U.S. averages for three other categories (urinary tract infections; maintaining residents' mobility; and maintaining their ability to conduct daily activities without help). At the last official count, FutureCare Homewood had a total of 136 residents - significantly higher than the Maryland and U.S. averages (107.5 and 86.2, respectively). And 136 people make for a pretty big household. But based on its overall Medicare scores, this facility has tried to live up to its homey name. The problem with many nursing homes is that the lack of competition in the area makes it easy to provide poor care. That is not the problem in this area of Baltimore. FutureCare Homewood is competing with so many nursing homes, including three FutureCare facilities right in the area. Let's take a look at first at the nearby FutureCare facilities. FutureCare Charles Village: This FutureCare facility is about three blocks down Charles Street away from FutureCare Homewood. Homewood seems to be better than the seemingly average Charles Village. FutureCare Cold Spring: Another not so great FutureCare nursing home that gets two stars overall and just 1 star for its awful health inspection (whereas FutureCare Homewood got four stars for each). But even this facility is well staffed. FutureCare Sandtown: This facility is pretty comparable to Homewood. Sandtown is not far from Druid Hill Park. It is 2.7 miles (a 10-minute drive in rush hour) from Homewood. Again, the competition is brisk, and it has some great nursing homes and some just awful ones. Roland Park Place: Roland Park is usually associated with quality, and this facility is no exception. Greater Baltimore Medical Center Sub Acute Unit: Great GBMC facility but so small it really should not count. Transitional Care Services at Mercy Medical Center: Ditto. GSNH Operator, LLC: Ditto for this Good Samaritan facility. Transitional Care at Good Samaritan: Ditto with a bad quality score. ManorCare Health Services - Roland Park: Even ManorCare has a decent facility in Roland Park, but it is not as highly rated as Homewood which outscored this nearby Baltimore facility in three of four main Medicare ratings (including a better overall score). The Green House at Stadium Place: This is near old Memorial Stadium. It is about as average as the Oriole teams of the late 80s before the stadium closed. Long Green Center: We talk about poorly run large chain nursing homes. This Genesis owned facility is a poster child for that narrative. Autumn Lake Healthcare at Alice Manor: FutureCare Homewood beat this Baltimore facility in three out of Medicare's four main rating categories. Autumn Lake's overall score was two stars (below average) in contrast to FutureCare Homewood's four stars. Keswick Multi-Care Center: Located half a mile from FutureCare Homewood, this Baltimore facility got a bottom Medicare 1-star rating for its health inspection and two stars overall. This is not a top-notch nursing home. Homewood Center: The is the Jets and the Sharks of Homewood. FutureCare Homewood trounces Homewood Center in its overall rating and health inspection (both four stars to 1), and also easily outpaces its namesake rival on staffing and quality measures. Has a FutureCare nursing home made an error that ended in tragedy? We can help navigate Baltimore's legal system, give you your legal options, and fight for justice and compensation for you. Our legal system and a Baltimore jury will hold a responsible nursing home accountable if the nursing home does not make the settlement offer that justice requires. Call our nursing home lawyer at Miller & Zois today at 800-553-8082 or get a FREE no-obligation case review. Call our nursing home lawyers right now at 1.800.553.8082 or get a FREE online case review if you believe you may have a potential nursing home neglect or abuse lawsuit in Maryland.